KALI CIESEMIER: "A Beauty, A Beauty"
So I took a break from drawing trains and drew a knight instead. 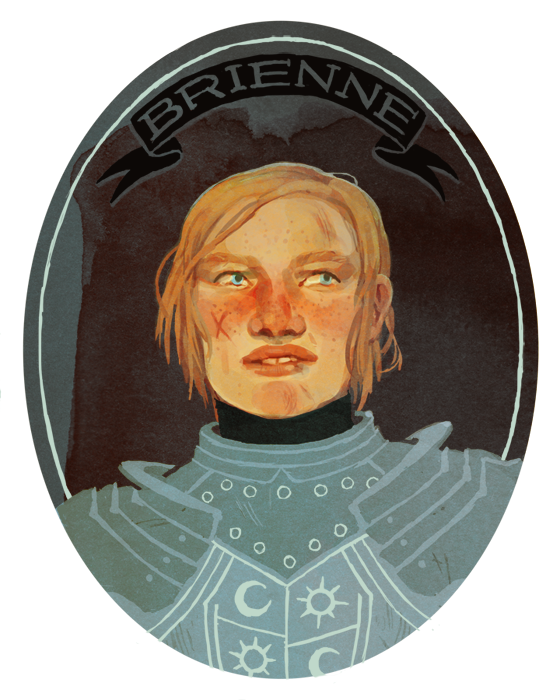 Here's Brienne of Tarth, from the Song of Ice and Fire series. She's a naive young woman with idealistic views about knighthood and honor. She also happens to wield a morning-star, is like 6'4" and super big, a strong fighter, and has a broad, ugly face with a broken nose, limp flaxen hair, and huge lips/teeth. Her one "pretty" feature is her large, clear blue eyes. She's a really interesting character. I probably drew her a little prettier than she should be. Sam & I are huge fans of the Song of Ice and Fire series (read 'em!) which will also soon be released as a new HBO show, Game of Thrones. We've been thinking of doing some fanart from the books and then making a tumblr together...we'll see, once we both have some more free time! I love what you've done here kali, the combination of simplistic forms and colors with a slightly more rendered head is freaking awesome (I think I might give something similar a shot too). I totally love this piece! Your artwork is so beautiful. I'm inspired every time I visit. Love this books too, great character. Your Brienne is exactly as I pictured her. Great work. I hope you do more. I'm with Kriss. This is exactly how I envisioned her. I always saw her as more beautiful than the descriptions in the books because I liked her personality. I love this. So... Much. I'm on book #2 and Brienne's character has just shown up for the first time. I totally saw your painting in my head as I was reading haha!